It took 159 days, but I've lost 17 pounds since I started adopting a new, healthier lifestyle. I'm halfway to my weight loss goal. (For you non-math-wizards, that means my total weight loss goal is 34 pounds.) I am so embarrassed by the all-time high number that displayed on the scale back in January and early February, that I'm not going to reveal that awful, awful weight. I will say that size 10 was getting snug and I really prefer to be a size 6 with plenty of breathing room. I will also reveal that the Body Mass Index calculator said I was borderline obese. Cringe! 1. The stress of having our lovely, posh (rented) condo unceremoniously sold out from under us halfway through our lease, and then realizing that to live in the area of the town we liked, we'd have to buy a house that needed quite a bit of work -- about six months worth of hot, dusty, sweaty, sore-muscle manual labor. 2. The kitchen at our new house was a wreck and housed painting supplies and tools for the first four months that we lived here. Fast food was always on the menu during that time. I thought that with all the hard work I was doing on the house, that surely I was burning lots of calories. Not so. 3. My dad died suddenly and very unexpectedly in October. This sent me into a tailspin of depression. When my dad literally dropped dead on his treadmill while exercising, the last place I wanted to be was at the gym. The first few times I went to the gym after his death, I cried while on the elliptical machine and cried during yoga classes. It's hard to exercise when exercise gets associated with sadness. There have been some major and minor stumbling blocks in my quest for a healthier lifestyle. I knew I needed to start eating healthier in general, and lose some of the new-homeowner bad habits I formed over the past year. On February 27, I started the South Beach diet. I lost 6 pounds in the first two weeks, which is known as phase 1 of the diet. Phase 1 is highly restrictive and difficult. Pretty much the only things a person can eat are lean proteins, vegetables (excluding carrots and potatoes of any kind) and small amounts of reduced fat cheese. There are no baked goods of any kind, no cereals / grains, no fruit, no "real" cheese, nothing containing natural or refined sugars allowed during Phase 1. I hate fish. I don't eat red meat. I had a serious addiction to whole wheat toast. This two weeks of Phase 1 was absolutely awful. I've heard of other people losing up to 15 pounds during Phase 1, so I was a bit disappointed to only lose 6 pounds, but consoled myself with the theory that slower weight loss is likely to be permanent weight loss. Since following the South Beach diet during Phase 1 and Phase 2, I've learned that Phase 1 is actually not good for a person like me. I have kidney problems and therefore need to limit my protein intake. When following a high protein, low carbohydrate meal plan, both uric acid and calcium oxalate stones are more likely to form. In fact, one study found that consumption of a low carbohydrate, high protein diet for 6 weeks delivers a marked acid load to the kidney, increasing the risk for stone formation.-- Reddy, S.T, Wang, C.Y., Sakhaee, K., Brinkley, L., and CYC. Pak. Effect of low-carbohydrate high-protein diets on acid-base balance, stone-forming propensity, and calcium metabolism. Am. J. Kidney Dis. 40(2):265-74, 2002. During the South Beach Diet early days, I was working through the stages of grieving due to losing my dad so unexpectedly. I was stuck in the depression stage for a few months. Quitting most carbs cold-turkey for Phase 1 of South Beach was probably not a good idea for me at that time. I felt not just tired and cranky on this diet, but physically shaky and angry. Many who are testing low-carbohydrate approaches like Atkins and the South Beach Diet are reporting unusually elevated feelings of anger, tension and depression, enough so that a new term ‘Atkins attitude,’ has been adopted to describe it. Judith Wurtman, director of the Women’s Health Program at the Massachusetts Institute of Technology and the Adara Weight Loss Center, has conducted studies on rats showing a connection between low carbohydrate intake and low levels of serotonin – a neurotransmitter that promotes feelings of happiness and satisfaction. In her research, rats placed on a ketotic, or low-carbohydrate diet for three weeks were found to have lower levels of serotonin in their brains. Wurtman believes that same effect occurs in humans on low-carb diets, leading to pronounced feelings of depression and sadness, even rage. -- Wurtman, R.J., and J.J. Wurtman. Carbohydrates and depression. Sci Am. 260(1): 68-75, 1989. In addition, Dr. Agatston, MD, author of The South Beach Diet advises patients to get about 20 minutes of exercise a day, such as walking. Um, yeah, I spend about 40 minutes on the elliptical machine and spend another 30 minutes doing stomach crunches, push-ups and lifting weights at least three times a week at the gym. This activity is in addition to daily chores like gardening, vacuuming, hauling laundry out to the washer, etc... and other "fun" exercise like hour-long walks with Chad, bike rides and occasional kayaking. I think I far surpass that "20 minutes of activity" advice most days. I need some carbs to make some energy, Doc! That said, I think that Phase 2 of the South Beach Diet has great guidelines for losing weight, and I loved being able to eat some whole grains again! The recipes in the South Beach cookbooks are good, if a bit involved sometimes. If any of you are looking for some nutritional advice, skip Phase 1 of South Beach Diet and go straight to Phase 2. Your weight loss will be slower in Phase 2, but it is much less painful, more nutritionally sound and much more likely to lead to sustained / permanent weight loss. I spent about two months at a weight loss plateau. I didn't gain any weight back, but I also wasn't losing weight from mid-May until mid-July. My dad's dad passed away on June 1, and I got physically sick with grief for a week. I had a cough, body aches and fatigue. My grandpa's passing was like a sequel to losing my dad just seven months earlier. While I didn't resort to any of my old unhealthy coping mechanisms such as mass doses of sugary baked goods or fried foods, I also wasn't getting as much exercise as usual. On July 4, I decided it was time to give up poultry as part of my slow transition to a vegetarian lifestyle. I don't mean to preach, but it is my personal preference not to eat food that once had a face. I still eat fish a few times a week (yuck), but eventually fish will go too. Not to worry, I am eating lots of soy, plenty of beans, egg-beaters, non-fat dairy and iron-rich veggies. There was an adjustment period to the new pesco-vegetarian diet which slowed the weight loss. 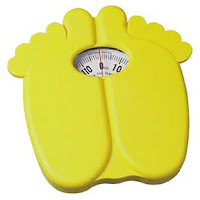 Finally, in late-July, the weight started coming off again. Which brings us up to last Friday when I stepped on the scales at the gym and found that I had maintained the halfway mark to my weight loss goal for a week! (I have this weird superstition that I can't really claim weight loss until is stays off for at least a week.) It feels great. Hopefully by February of 2008, I'll be in the maintenance phase of this health-kick-hullabaloo. And I'll being wearing a size 6 with breathing room.